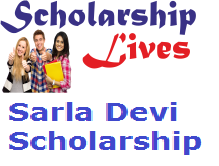 Dharampal Satyapal Charitable Trust has circulated Sarla Devi Scholarship 2019 Online Application form to the support of the meritorious students belonging to financially needy families. The main objective of this scholarship scheme is to help the meritorious students and belonging to financially underprivileged families and completes their higher education in Science, Arts, Commerce and Vocational studies. Applicants based around Delhi NCR can get a scholarship of up to INR 75,000 subject to satisfying the eligibility criteria for the scholarship. Point 1: Get the Sarla Devi Scholarship 2019 application link. Point 2: Login/Register using Facebook, Google or Email account. Point 3: Once signed in, press on Start Application to start filling the form. Point 4: After that fill all the essentials details in the correct place. Point 5: Finally, press on Submit.